» Oregon farming: It’s a big deal! Oregon farming: It’s a big deal! Harvest work goes on in a field off Bryant Drive outside of Albany on Thursday. You should hear far more than you do about Oregon farms. Why? Because Oregon would be much poorer without agriculture, and the country would be less well fed. Late August is a good time to think about this. 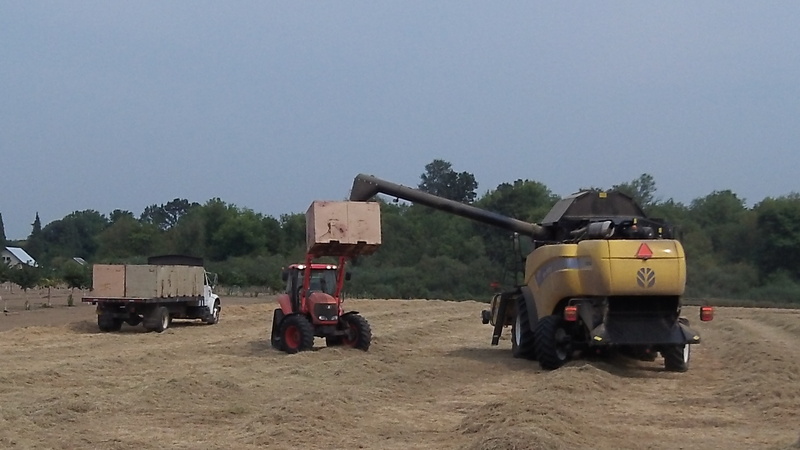 The harvest is winding up and city people can see some of the work going on in the fields. How important is farming? I looked up some numbers. Oregon farm production was valued at $5.4 billion in 2012, up 2 percent from the year before and a record. Wheat is the biggest item, but seeds are second, and in that category the mid-valley plays a big role. Linn County growers sold more than $300 million of commodities in 2012, and much of that was annual and perennial ryegrass seed. Oregon as a whole produces 97 percent of the ryegrass seed — and almost all of several other grass seed varieties — in the United States, making us the undisputed leader. Oregon also is number 1 in production of blackberries, boysenberries and some other berries, hazelnuts, sugar beet seeds, peppermint, Christmas trees and potted azaleas. From Rhea Graham, via Facebook: How about instead of growing those grass seeds that in turn require a bunch of water and fertilizer we grow hemp plants that can be made into medicine, fiber, paper, food, fuel, and more? Wouldn’t that be a wonderful change?